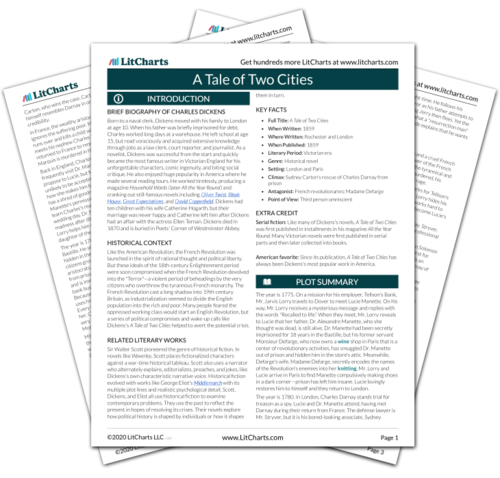 Instant downloads of all 942 LitChart PDFs (including A Tale of Two Cities). 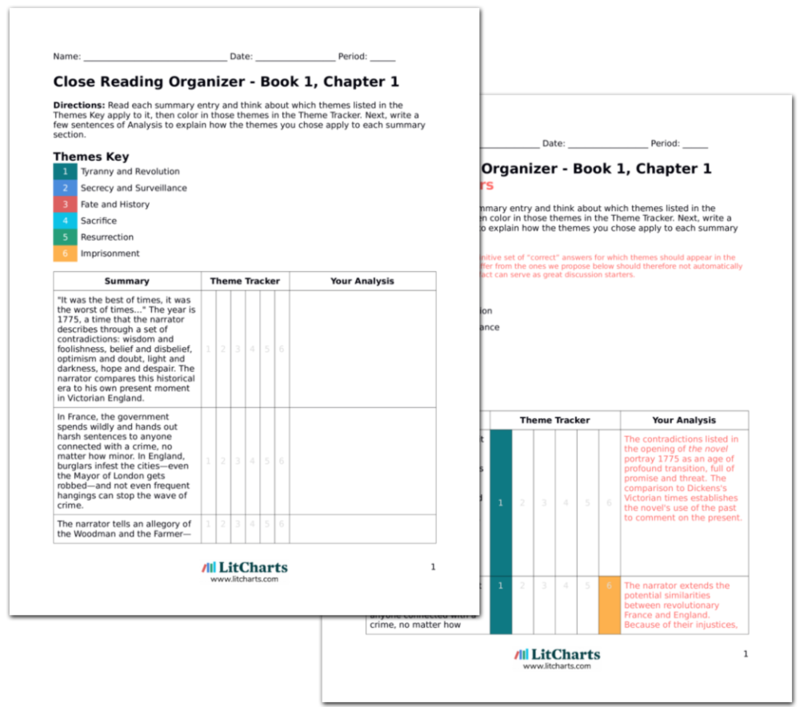 LitCharts assigns a color and icon to each theme in A Tale of Two Cities, which you can use to track the themes throughout the work. In Dover, Mr. Lorry takes a room at the Royal George Hotel. The 17-year-old Lucie Manette arrives that same afternoon, having received vague instructions to meet a Tellson's Bank employee at the Royal George Hotel regarding some business of her "long dead" father. Though he describes his news as just a "business matter," Mr. Lorry struggles with his emotions as he explains the "story of one of our customers"—Lucie's father, Dr. Manette. Mr. Lorry works like a secret agent for Tellson's Bank. He uses the cover of "business" to assist in political activities (like freeing Dr. Manette). But he also uses "business" rhetoric to hide his feelings and protect others' emotions, even when explaining a father's history to his daughter. 20 years ago, Dr. Manette, a renowned doctor, married an English woman and trusted his affairs to Tellson's Bank. One day, Manette disappeared, having been jailed by the authorities and taken to a secret prison. Rather than tell Lucie the truth, Lucie's mother told her that her father was dead. Lucie's mother herself died soon afterwards, and Mr. Lorry took Lucie from Paris to London. Lucie learns her own and her father's real history—her father suffered imprisonment at the hand of a tyrannical government. Lucie's history makes her a figure who connects the "two cities" of Paris and London, and in A Tale of Two Cities, characters cannot escape their histories. Mr. Lorry braces Lucie for a shock: her father is not dead. He has been found, though he's a shell of his former self. Manette is now in the care of a former servant in Paris, and Mr. Lorry tells the astonished Lucie that he and she are going to go to Paris so that she can "restore [her father] to life." Lucie's servant, the loud and red-haired Miss Pross, rushes in and shouts at Mr. Lorry for upsetting Lucie. Mr. Lorry asks her to travel with them to France. Though freed from jail, Manette is still imprisoned by his traumatic history. It now becomes clear that Lucie is the woman whom Lorry in his dream hoped could save Manette. Miss Pross is a stereotypical British servant, brash, devoted to her mistress. Fyfe, Paul. "A Tale of Two Cities Book 1, Chapter 4." LitCharts. LitCharts LLC, 22 Jul 2013. Web. 11 Jan 2019. Fyfe, Paul. "A Tale of Two Cities Book 1, Chapter 4." LitCharts LLC, July 22, 2013. Retrieved January 11, 2019. https://www.litcharts.com/lit/a-tale-of-two-cities/book-1-chapter-4.